Posted October 24, 2013 by admin & filed under City Hub. State Government budget cuts have forced the closure of Redfern Fire Station 37 times in less than a year amid concerns over a lack of fire safety equipment in high-rise public housing. 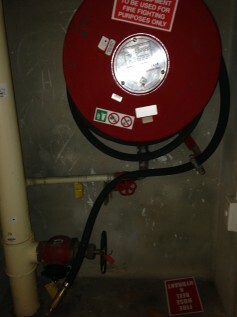 A number of public housing establishments in Redfern are missing fire extinguishers, have broken fire exit lights and lack fire evacuation procedures. One building in Morehead St contains fire cupboards on numerous levels that lack fire extinguishers, despite signs on the doors stating a fire hose and extinguisher are inside. City of Sydney Councillor Irene Doutney, a public housing tenant, warned that elderly people needed fire extinguishers when tackling small fires and called for evacuation maps to be installed. “For a lot of elderly people a hose is hopeless – how are they going to use it, unwind it and turn it on? With a fire extinguisher, if you’ve got a little fire in your kitchen, you can just spray it,” she said. The O’Farrell Government’s public sector cuts have compelled Fire and Rescue NSW (FRNSW) to make $64 million worth of savings over the next four years. This has led to understaffing at FRNSW and is hampering the agency’s ability to ensure that public housing meets fire safety standards, according to the Secretary of the Fire Brigade Employees Union, Jim Casey. A City of Sydney spokesperson explained that Council carries out inspections of commercial buildings only in response to FRNSW and complaints from residents. “Council conducts fire safety inspections of commercial and residential buildings in response to complaints from residents or reports received from FRNSW,” said a City of Sydney spokesperson. Budget cuts have led to the practice of temporarily taking fire stations offline (TOLing) due to sickness or absence. Stations are TOLed if there is less than a minimum safe crew of three fire fighters, with the remaining squad sent to other fire stations in Sydney. “By closing Redfern Fire Station the government is risking the lives of the community,” said Mr Casey. “Station closures mean that fire trucks and crews from surrounding areas take longer to get to an incident. One practice that occurs with TOLing is labelled ‘Stand By’, where a fully manned fire station is closed and moved to cover another TOLed fire station. Since November 2012, Redfern Fire Station was closed 26 times due to this practice and only 11 times due to sickness or absence. Mr Casey said: “The union has been collecting stats of stations performing Stand Bys because even though the station hasn’t been officially TOLed, it has the same effect – that is that Redfern residents were without fire protection for that day or night. Fears remain the budget cuts will inevitably lead to tragedy due to longer response times. “Eighty five per cent of the oncosts in fire fighting is wages – cuts of this magnitude will mean less fire fighters and that means longer response times,” said Mr Casey.